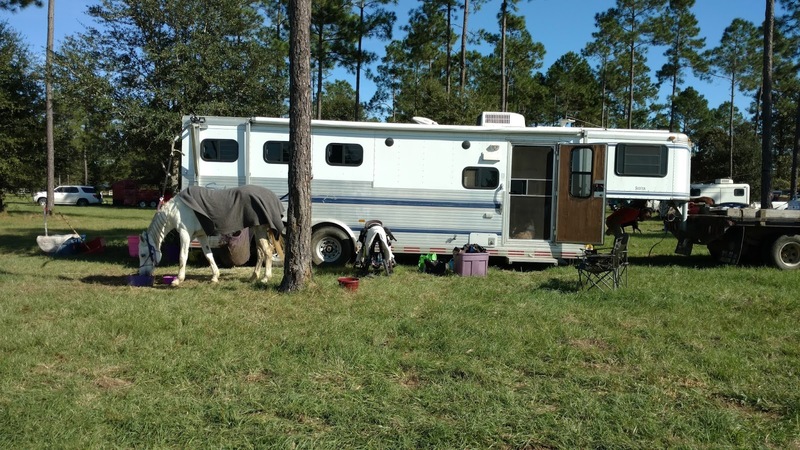 I finished up my 2015 endurance season this past weekend at Blackwater Boogie. Daniel and I took Sasha down on Thursday. We usually try to arrive 2 days before an event, but this time we had to leave on Thursday. We left at 5:30 AM and took our time getting down there. We only had Sasha, so we did a minimal camp set up and left it at that. We were parked close enough to vet check from the trailer and I had all my vet check stuff handily packed and ready to go. We had quite a bit of time to relax and chat. Ride meeting revealed that we would start at 7 AM, despite the fact that it would be light by 6 (sunrise at 6:11). Since this is after the time change, sunset would be at 4:53 PM. Further, the vet holds would be 50 minutes each instead of 40 minutes as I had expected. I had planned to do a slow and steady ride with Sasha. This was her first season, her 4th 50 and she just did a fantastic job of doing a 50 at Spook Run (carrying Lillie) just 2 weeks before. But with the compressed time frame, I decided I'd better bump up my expectations and try to keep a good steady 7 mph average. I had wanted a 6 mph pace originally. 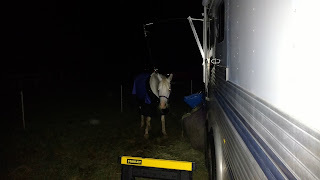 I figured I would see how she handled the pace and if I had to drop back and I wouldn't finish before dark, I would rider option at the second vet check. Ride morning was cool, but not too bad. 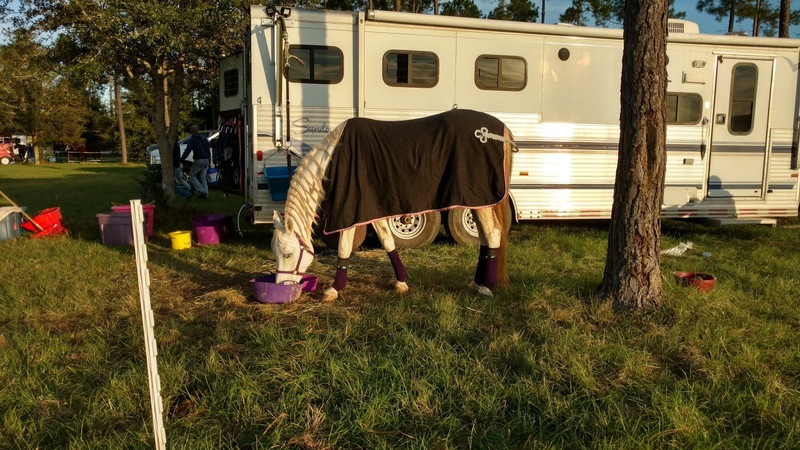 After saddling Sasha, I tossed a wool blanket over her hindquarters to keep her warm. When I went to get on her, Sasha had a bucking fit!! She has never done that under saddle before. I'd forgotten to remove said wool blanket before getting on her. Well, that was fun. I did not come off and she stopped bucking after 5 or 6 good hard bucks that made sure the wool blanket was on the ground. After that excitement, Sasha turned back into my sensible girl again and we warmed up. With Tanna, in his early years, I had to go out at the back of the pack. He could not keep his brain intact in a group that early in the ride. Sasha is wonderful in a group, pays attention to me and is quiet, so I did not waste any time hanging around camp at the start. First loop, we went out at a fairly fast pace. I kept her at a trot and just under 10 mph. The first 5 miles took us 34 minutes. Yikes, too fast. After that I was able to start getting her to walk more to bring down the average speed. I had one of my GPS watches (yes, I was wearing two...) set to auto-lap every mile. I had the screen set up to show me how long we'd been out on the loop (Timer), the current average pace for this mile, and total distance. Since it was lapping every mile, I knew if the distance said 4.54 miles, I was a bit over half way through the mile. If you're curious, my second GPS was set to show me Sasha's heart rate, current speed, average speed for the loop (not just the current mile) in mph, and again, the total distance for the loop. My goal pace for every mile was 8 minutes 34 seconds. I reset my expectations for every mile. I didn't try to slow down enough to "make up" for the faster miles we did at the start as the other horses were shaking out into their grooves. If we'd found ourselves riding with another rider, that would have been fine, but my goals were my goals and that's what I was going to do. We settled into a rhythm where Sasha trotted for a good portion of the mile and then we walked for 1-2 tenths of a mile to get the average pace for the mile back down to a reasonable level. We did the first loop in just over 2.5 hours. Sasha came into the check looking great. Her HR was immediately down. 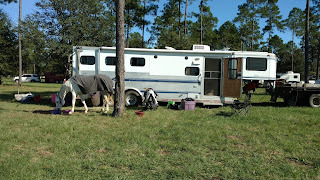 Daniel met me at the in-timer and we got her to our trailer, pulled her tack and back to pulse in just 7 minutes. 55 pulse, 48/48 CRI and As completely across the board. She had dropped weight from 814 pounds at vet in the day before to 772 pounds. Normal. She gained a little weight back in the next loops. Sasha spent the entire hold eating. Good girl!! I ate some as well, then Daniel and I saddled her back up. She shied away from the saddle, which was annoying, but then stood quietly. 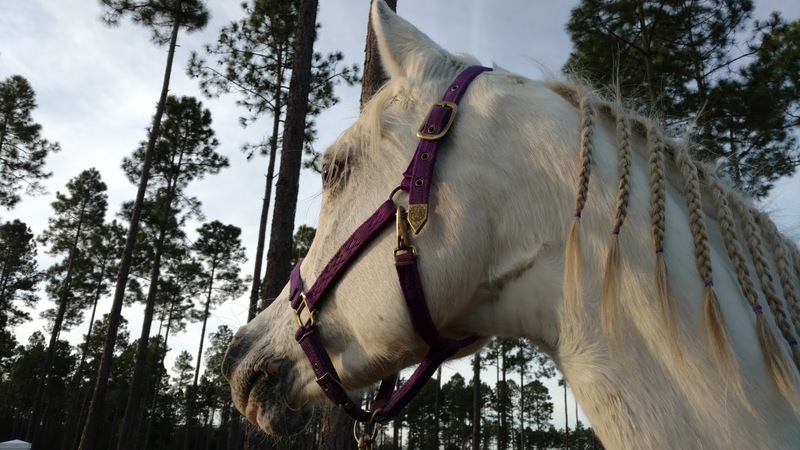 I switched from her kimberwicke bridle to her hackamore. First time to ride her in a hack during an event. We made it back to the out-timer with 3 minutes to wait to be released on trail. I kept Sasha moving to keep her warm and off we went on the second loop. This loop it was a lot easier to get into the groove as we were riding alone and all the adrenaline had burned off and now we're just in work mode. Sasha was working well, but went through what I call the "30 mile blues" about 8 miles into this loop. We had a couple of slow miles where she piddled around and tried to convince me that it was time to quit or turn around or go find Tanna. Anything except keep going the direction I wanted. Her heart rate told me she was ok. She'd be trotting along and then get slower and slower and slower, then stop. And her HR would be dropping like a rock. 64 by the time she finally stopped and dropping lower. Um, yeah, let's go, Little Girl. I'd click to her or just lightly squeeze my calf against her side and she'd jump into her 8 mph trot again. When we split off from the blue trail (our first loop) to circle around the back of camp to get some extra mileage, she really thought I lost my mind. Clearly, I didn't know where camp was and she must help me. 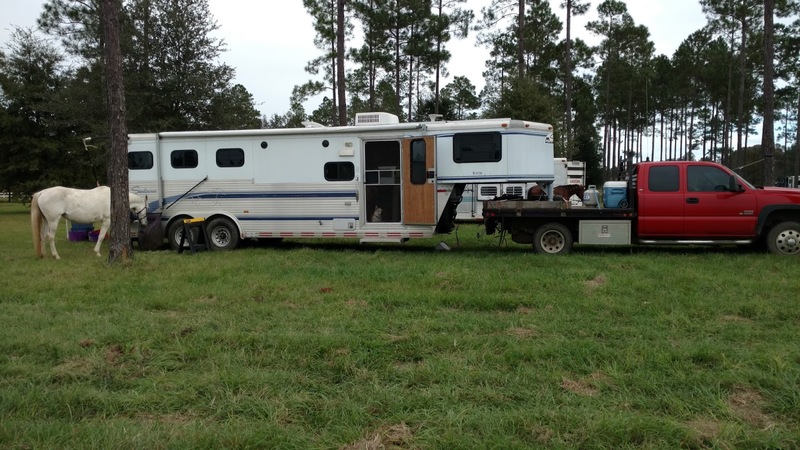 She tried repeatedly to cut cross-country to head directly back to camp. It was "just over there" after all. We managed to do this loop much closer to my planned pace. Just slightly faster, but not concerningly so. We got her to the vet in 10 minutes this time. I spent a little extra time cleaning her up before taking her to the vet. 53 pulse. 52/52 CRI. A few A- on her card, but the rest were A. One of the A- was on impulsion. She was not a happy camper at this point. Mentally, she was over this whole "running around in circles by herself" day. But she was sound and fit and all signs were a go. Our out-time was 1:30. Plenty of time to get that last loop down before dark. The last loop was only 11 miles. Much shorter than the 2 previous loops. We got to Nancy (the out timer) with 45 seconds before our out time. Sasha expressed her opinion that she'd rather not, but went after a few seconds conference with me. 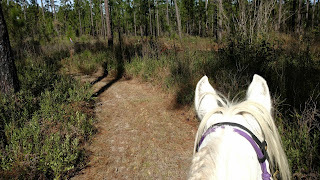 We trotted beside the road, took a left into the brush and off we went. Sasha still was not happy to be out there. I pulled out my mp3 player and single earbud and sang along. She perked up and moved out more happily. Maybe it was just to get done faster and shut me up! She began to canter some when I was singing and I noticed her HR lowered significantly when she cantered. So we added more specific cantering to our rotation. Trot for 1/2 mile, canter for 1/3 mile, walk the rest of the mile, repeat. Sasha's canter was a nice smooth, easy, canter. About 11 mph. Not fast, not extended, just easy moving. Delightful. I'm going to have to develop this a bit more in future training rides. I was happy to see Nancy at the finish line. I always am. 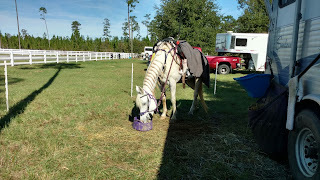 :) Sasha did her nice easy canter for the last 1/3 mile of the loop across the finish line. Happy to be pointed at camp. I rode her back to the driveway and then hopped off to walk her in. Daniel was off doing something else, so I took her back to the trailer and let her eat while I pulled her tack. I let her eat for a few extra minutes while I cleaned up some of the worst of the mud. Finished, all vetted and still eating. She vetted in wonderfully at the finish. We vetted in 15 minutes after crossing the finish line. 40/44 CRI and only a B+ on skin tenting. As much as she'd been drinking, she still could have drank more. But since I didn't clip and she'd just done her fastest 50 and it was about 70 degrees and sunny and she was still eating and drinking and just looked good, I was happy. What a good, good, good girl!!! Sasha did that ride in 6 hours 34 minutes, good for 8th place out of a field of 15 starters. Definitely a a good bit faster than I would have normally planned if I hadn't been trying to beat the sun, but she came through it in fine style. Having it be a flat ride was also helpful. Eating and drinking well, no soreness, good tight legs. Just a bit of an attitude problem, but I really think it's a learning curve for her to just learn to roll with it. We won't always have another horse to ride with and we won't always have varying terrain. And while she wasn't thrilled, she did do a great job. Sasha the next morning watching the 50 milers start. Bright and cheerful. Now the horses get a break until after Christmas. Shoes off, just running around, eating, being horses.